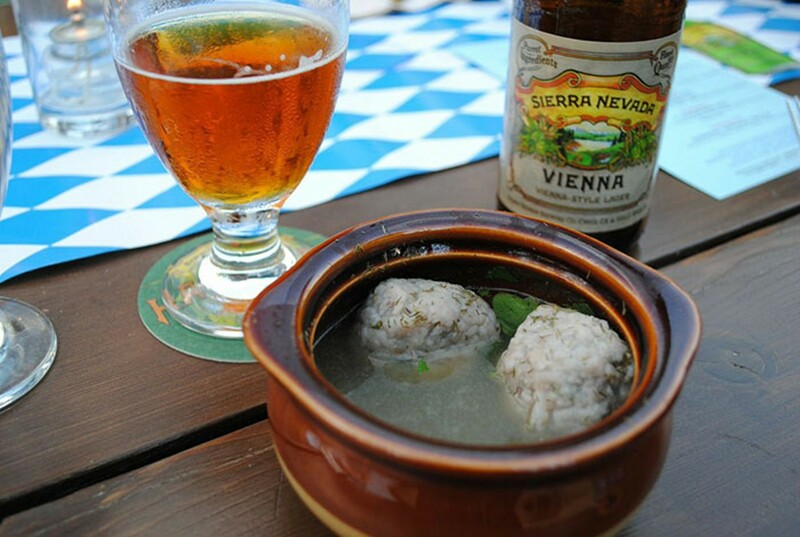 OCTOBER FEAST Sierra Nevada's Vienna lager goes well with potato dumplings with sweet walnuts and dill. Oktoberfest came to HopMonk Sebastopol last weekend. The brewpub, which also has locations in Novato and Sonoma, hosted the latest in a series of beer-maker dinners aimed at elevating brew's place in fine dining. This time, HopMonk's Dean Biersch and Kim Schubert invited Sierra Nevada Brewing Co. to collaborate on an Oktoberfest-themed beer dinner. Guests were met with a glass of the brewery's well-known pale ale and bite-size schnitzel to whet their appetites for the six-course meal and beer pairing to follow. Each course was punctuated with a breakdown of the food and beer from the experts on hand. Ryan Tovey and Christian Griffith of Sierra Nevada's Torpedo Room in Berkeley led what can only be described as beer history lessons, of both Sierra Nevada and their seasonal brews, and the story of beer in general. Guest involvement was encouraged and the result was spirited discussion on everything from the rise of the Vienna-style lager in Mexico to the origination of Russian imperial stout. For beer lovers the dinner offered a wealth of information served alongside the food and beer. Although the focus of the evening was the beer, the food pairings were perhaps the most exciting. HopMonk chef Billy Reid presented his vision to complement and incorporate each beer into the corresponding food course. Preparation began weeks ago as Reid's team discussed each beer's flavor profile and tried to build the menu around the Oktoberfest theme. One result was a grilled bratwurst sausage with Sierra's Oktoberfest beer inside the sausage and braised in it, served with spaetzle, cabbage and apples. Even the potato dumplings with sweet walnuts and dill featured Vienna lager in its broth. The entree was traditional sauerbraten served with red potatoes and Brussels sprouts kraut alongside the Harvest IPA. Two dessert courses rounded out the meal: Flipside Red IPA with a caramel- and chocolate-covered soft salted pretzel, with Narwhal Imperial Stout served last with German chocolate cake truffles on skewers. So why would an event featuring well-known Sierra Nevada Brewing be thrown on such a small scale? Tovey, the Torpedo Room's manager, says their goal is to stay true to their roots and to "tell the story of craft beer." The fact that HopMonk is a hub for lovers of craft beer makes it the perfect locale to feature the next level of beer appreciation, and pair it with delicious Sonoma County cuisine. Sierra Nevada's success dates back to the first days of the microbrew revolution and is attributed to their grassroots approach to marketing and of course their flagship pale ale. A 1982 article in the San Francisco Chronicle about the brewery helped give the brewery an initial boost. They strive to preserve their grassroots method, and have a great time, as demonstrated by events such as these small-scale beer dinners. If you missed last weekend's event others are on the way. Look for beermaker dinners featuring San Diego's famed Stone Brewing, Lagunitas, and Anchor Brewing, the brewery that started the whole microbrew revolution back in the 1970s. The dinners cost about $65.